I’ve been having pie on the brain lately. Peach pie. Strawberry pie. Apple pie. 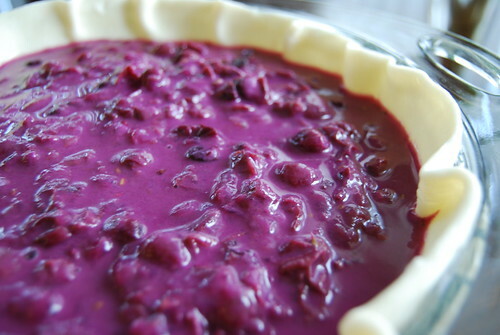 And especially, grape pie. There’s something about the impending approach of fall that drives me into pie mode like no other season does. It’s been two years since I made a Concord grape pie. It was a daunting task to remove seeds from four pounds of concord grapes to fill two pies. 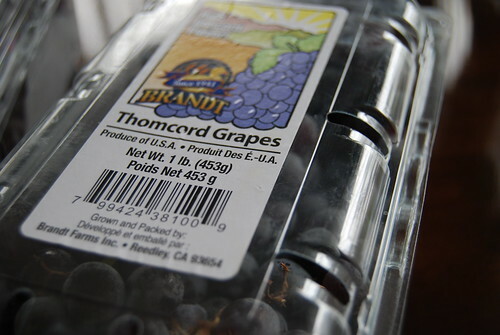 This year, I discovered Thomcord grapes — a hybrid of Concord and Thompson grapes. Initially, I was skeptical about the rich Concord taste being diluted in this unknown hybrid. But upon tasting the grapes, I noticed it was a bit sweeter, the skin wasn’t a tough as Concord grapes and more importantly, no seeds! This recipe is slightly modified from the original and uses less sugar. While the color is slightly less intense than using full-on Concord grapes, the end result is just as pretty and sure to impress. Don’t forget to add a scoop of vanilla ice cream! Remove grapes from stem and rinse under water. In a large pan, heat the grapes over medium heat. Using a spatula, gently press down on grapes until the skin separates from the pulp and the juices start to release. Continue to heat 15-20 minutes or until most of the skin has been separated and the pulp is slightly pureed. Add sugar, flour, corn starch and lemon juice to cooled filling and mix until combined. Pour the filling into a prepared pie shell, cover with lattice top or decorative pieces of dough and bake for 45-50 minutes. Chill in refrigerator for 4 hours and serve with vanilla ice cream. Concord grapes with foccacia seem interesting — I can’t seem to wrap my mind around how it would taste. And yes! Seedless grapes are a godsend!! 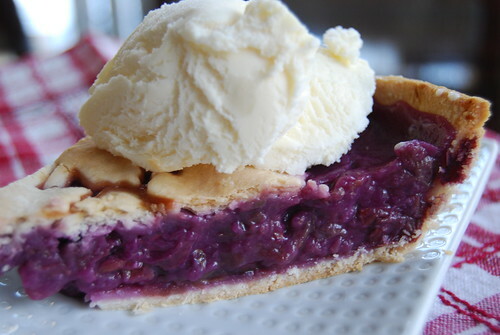 I can now say I am a fan of grape pie! It’s like blueberry pie but, uh, more grape-y. And I love your little leaf cutouts on top! Yes, they do seem kind of blueberry pie-ish but purple. The leaf cutouts are a way for me to disguise the fact I don’t know how to make a lattice top. ooh, i’ve never had grape pie but i know i already would love it! i also did not know about the marriage of thompson and concord grapes. yummm, gotta look for those! Thomcord grapes are so good! I bet healthier too since the skins have a dark hue and (maybe) more antioxidants. I don’t know how long they’ll be in season so look for them! I love the color of that pie. I love the fall especially since my grandma makes persimmon pie for just about every family gathering once the fruit starts falling from the tree in her yard. So good and a nice change from apple! It’s really awesome and a nice change-up from apple (and basically follows the same recipe). It really gives the subtle flavors a chance to shine, especially if you’re not a fan of fresh persimmons like my husband. Since she has a giant tree, we’re inundated with persimmons through the fall. Even with extended family stopping by to pick up bags of fruit, she still has a lot left over. So, she got to experimenting years ago and the pie was one of the winners with our family. Since she uses pre-made pie crust, it’s a relatively quick and easy Thanksgiving dessert (really important since she’s pushing 80 and still insists on cooking up enough for an army!). Oh! I’m seriously going to try this. My husband doesn’t like persimmons either so this might be a good way to mix it up. Thanks again for implanting this idea in my head!! Pingback: The City Sweet Tooth » Sweet Links of the Week – September 23rd! grape pie? i wanna marry you! LOL! Will you provide me with endless Thomcord grapes? If so, then the answer is YES! You can get Thomcord’s at Trader Joe’s, Stater Bros, Some Safeway’s & Publix and various supermarkets in Montreal and at Coop in Alberta and Saskatchewan. Good to know. Thank you for the heads up!